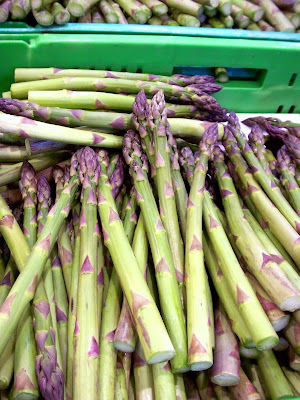 Horowhenua asparagus ($13.95/kg edited - sorry, I noted the wrong price), spotted at Moore Wilson's. Asparagus season, my favourite season of all, has begun. I've splurged on some crisp-looking stalks and some prosciutto to mark the occasion... Happy eating, everyone! UPDATE - I returned to Moore Wilson's a couple hours later and all traces of asparagus had vanished. Glad I was quick, more tomorrow perhaps?